Does your child become anxious or scared at bath time? If so, try these techniques that I’ve successfully implemented with my own children. Recently, my toddler started to become scared of bath time. At first, she would cry in protest. Just saying the word “bath” would have her running away. But slowly, I have applied these techniques that I’ve used for my other kids and not only is she no longer afraid, she’s actually having fun during bath time! 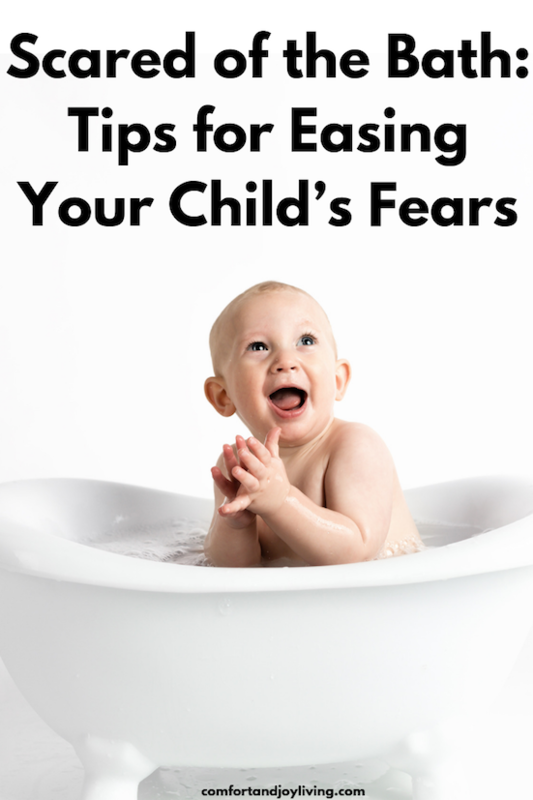 If your toddler has the same fears, try using these methods to help relieve your child of her anxiety and ease her back into the bath. • Place your child in an empty tub at first. Your child may become afraid of the bath when she sees the tub filled with water. Instead of filling the tub up first, place your child in the tub with no water, and then fill up the tub. • Keep some clothing on. Bath time battles may begin with removing your child’s clothes. Keep your child’s shirt on while she’s sitting in the tub and as the water gets higher, remove it. Keeping some clothing on may relieve some anxiety. • Test the water temperature. A warm bath can be comforting to your child. During cold weather, try turning a heater on in the bathroom. In the summertime, cooler water may feel good to your child. • Use your hands to bath your child. My child didn’t like it when I used a washcloth, so I used my hands instead and noticed that it helped her to relax. Direct skin on skin contact is very soothing and relaxing for toddlers. • Integrate your child’s interests. Does your child enjoy watching boats or feeding ducks. If so, use toys that resemble her interests. My daughter loves feeding the ducks at a local pond, so I bought a toy duck for her bath time. She loves it so much and it’s helped her enjoy her bath. • Use bath toys and books. Even if you already have bath toys, a new set may help her focus her attention on something else. You can also read to your child to help her focus on a story. I’ve read children’s books about bath time to help my kids with their fear. • Try to find the reason for the fear. Is your child afraid of the water? Try to help her by reassuring her that she is safe. You can gradually reintroduce her to the bathtub with a sponge bath. You can also get in the tub with her so you can hold and comfort her. Maybe there’s another reason for the fear. One of my kids was afraid that she would go down the drain because she noticed the water draining while I was drying her. So I left her toys in the bath while I was draining the water and showed her that while the water went down the drain, her toys remained safe in the bathtub. • Make bath time a positive experience. Do you get stressed by anticipating a bath time tantrum? Or are you calm and relaxed? Your child will notice these behaviors and react accordingly. There are lots of ways to make bath time fun and enjoyable instead of a stressful time. Play soft music to help your child relax. Or play her favorite music to focus on. You can sing songs and have your child sing with you. You can also use items like squirting toys, bath finger paint, bath crayons and foam toys. Making bath time fun and playful will help your child get over her fear and she’ll have a more relaxed and enjoyable time. Does your child have trouble with bath time? What have you done to ease his or her fears?